Space Hulk: Deathwing - Enhanced Edition arrives on May 22, 2018! Dive into today’s brand new Gameplay Trailer to celebrate the upcoming release, will be available free for all current owners on PC. 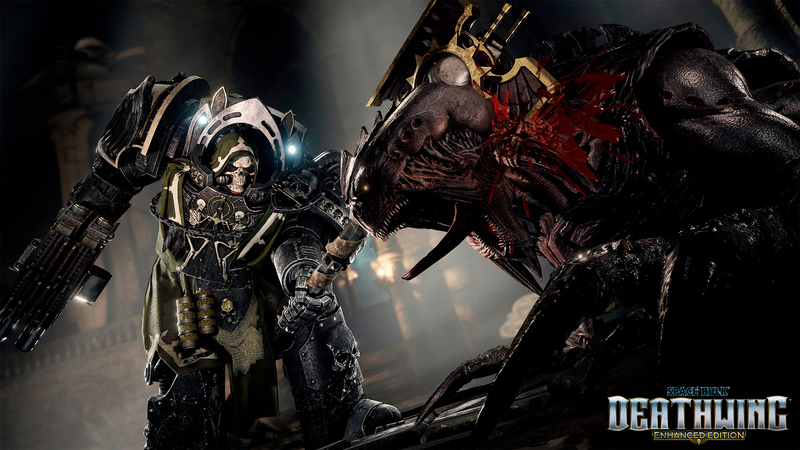 Play as a Space Marine of the Deathwing – the feared 1st Company of the secretive Dark Angels – and engage in a desperate battle against Genestealers within the confines of a Space Hulk. Grow more powerful, gain skills and abilities, and master devastating weapons as you earn experience. Class Customization – deep progression system lets players unlock armour and weapon skins, attachments, perks and more for aesthetic and gameplay customization. New Weapons – more melee and ranged weapons give players even more options to load out their squad for battle. All aspects of the Class Customization are earned entirely in-game, with no microtransactions. Several of the above features have already been made freely available on PC, as part of the game’s ongoing support. Space Hulk: Deathwing - Enhanced Edition arrives on May 22, with all Enhanced Edition content free for owners of the game on PC. i mean seriously this game is gointo give me an epileptic seizure soon..because too much flash. ok. it is nice you are fixing things. THANK YOU. But i till find this game fustrating. 2 things that are my main issues with this game. 1 muzzle flash. guns make the screen flash way too much. making seeing things really difficult. please make option to take of flash. it ruins this game. number 2. weapon spread. especially with assault cannons. terminator who have targetters, auto stabilizers, tracking systems, recoil dampeners etc..cant shoot further than 20 meters and after that cant hit anything. when i use targetting i expect pin point accuracity. up 100meters. spread and recoil both needs to be redone. if these changes are not made. i cant play this..just cant. SO ready to play this again! Good♥♥♥♥♥♥devs, happy to be redownloading it rn. Let's hope it's as good as it sounds. Its the 22nd GMT. When can I purge xenos with my enhanced Terminator armor? anyone know what time it will go?